I think everyone should grow a pot of herbs. 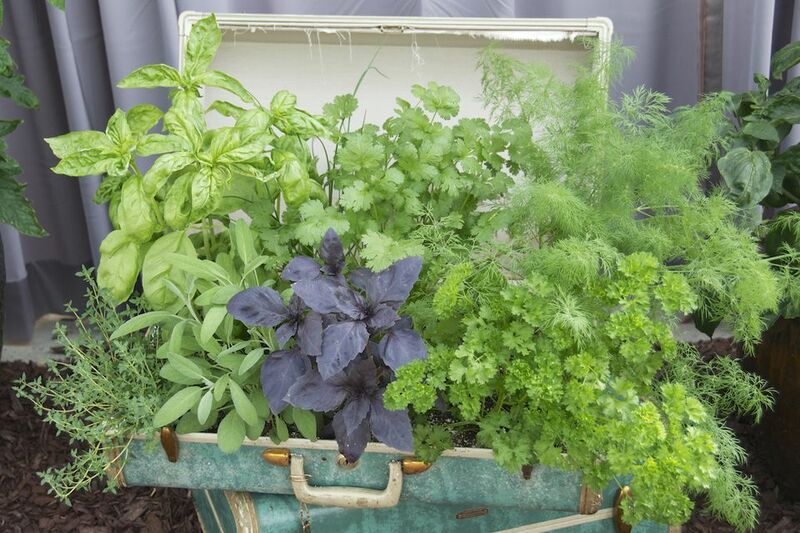 Even if you only have a tiny spec of outdoor space, if you have some sun, you can grow herbs. Most herbs grow well in containers and some (like mint and lemon balm) should be grown in pots because if you grow them in your garden, they will try to take over the world. Also, many are pretty forgiving and even beginners can grow them with success. I grow herbs for cooking and decoration as well. I will often put herbs in mixed garden pots because they can add great fragrance and texture. The following list contains some of my favorite herbs to grow in pots. Almost any recipe is better if you put parsley in or on it (okay, perhaps not chocolate mousse, but you get my point). Parsley is exceedingly easy to grow. You can either buy seedlings, almost anywhere that sells plants or grow it from seed. I usually buy seedlings because the seeds can take weeks to germinate and are fussy about transplanting. If you do start parsley seeds, soak them overnight before planting. Parsley comes in two types, Italian, also called flat parsley, and curly parsley, which is the more common variety. Many people prefer flat parsley for cooking and curly parsley for garnishes. I’ve never been able to tell the difference in taste. Parsley prefers full sun but can grow in partial shade. It’s very hardy and will make it through a frost. I’ve even found perfectly usable parsley under a few inches of snow. To harvest, just snip off at the base of a stem. As with most herbs, the more you harvest, the more you’ll get. Parsley is biennial, which means that it can come back for two years, though some think the leaves are more bitter the second year. Mint makes a perfect container herb. Some mints spread so fast and aggressively, that keeping them in a container is the only way to prevent them from taking over your garden. Also, many varieties of mint are beautiful and make a great addition to a decorative planter. Mint is an incredibly easy plant to grow—hence its ability to take over the world. Mint likes full sun, but most will tolerate some shade. Some, like spearmint, can be very tall and leggy and some are low spreaders, so make sure to check your plant tag. Mint will thrive and get bushy if you keep it pinched back. As a bonus, mint roots easily from cuttings. I particularly like pineapple mint, with its variegated leaves or apple mint or chocolate mint. When I make iced tea, I add handfuls of mint while it is steeping. You can also make an easy tea (also called a tissane) by simply pouring water, just after it has boiled, over the leaves and steeping for a few minutes. Spearmint makes a particularly delicious tea. I love oregano in container gardens. The leaves are beautiful and it is a plant that thrives on neglect. Oregano loves sun, and not too much water or fertilizer. Pinch back regularly to keep the plant compact and to keep it from blooming. Oregano is a perennial that you can either overwinter in a cool place or propagate from cuttings. Try golden oregano or Greek oregano for culinary uses and 'Herrenhausen' or ‘Kent Beauty’ for great flowering. I often use oregano in mixed containers. It spreads nicely and goes with almost any other plant. Basil can be a bit temperamental. It is easy to start from seed, but is fussy about temperature—it gets depressed if the thermometer dips below 50 F. If you live in a cold climate, don’t attempt to put basil out early. If you are as impatient as I am, you can also put it in a small enough pot and bring outside during the day and inside in the evening. I also put my pots on carts and drag them in and out of the garage until temps warm up. Basil also doesn’t like to be crowded and needs plenty of air circulation to be happy, so give each plant plenty of space. Basil gets cranky if its leaves stay wet, so water carefully. Try to let the soil dry out a bit between watering, but not to the point where the plant wilts. When your plants are about six inches tall, pinch them back so they will grow full and bushy. Make sure to keep harvesting and pinching back for the best production. After you pick basil, never refrigerate it as it turns black and icky. Either use right away or make into pesto and freeze. You can also put branches in water. You don't want to let basil flower, because it will get bitter afterward, so keep using it or pinching it back. I like Genovese basil for pesto, 'Siam' basil for Asian recipes, and lemon basil for garnishing drinks. Large-leafed basil like 'Mammoth' or curly basil are great for sandwiches. 'Spicy Globe' has tiny leaves and is a compact bushy plant and is gorgeous and looks beautiful in a small pot. There are also several purple basils that are tasty as well as beautiful and look great with cut flowers. Basil is very easy to root in water. I find that rosemary is one of the most interesting and stunning herbs to put in a pot. Its stiff and spiky texture is gorgeous and the smell just can’t be beat. I have seen hedges of rosemary grown in pots, which are beautiful and incredibly fragrant. There are two types of rosemary—upright and creeping. Both are lovely and tasty. Rosemary needs full sun and well-draining soil. Let it dry out a bit between watering, but don't let it dry out completely. If you live in an area about zone 9, (where temperatures stay above 20 F), chances are good you can grow rosemary outside year-round.